This article will demonstrate how to put multiple data disks on a General Purpose server into a RAID level 0. We will mount a single data disk and perform read and write tests, then continue by putting two data disks into a RAID 0. 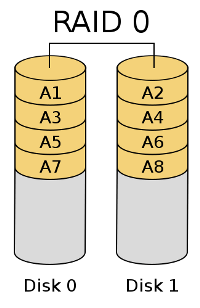 A RAID 0 stripes (combines) two disks to look like one drive to the system, usually increasing performance (particularly read access). While a RAID level of 0 only stripes the disks and offers no data redundancy, the hypervisor (host server) is backed by a RAID 10. This RAID 10 provides redundancy for your data on the backend. Creating a RAID level 0 requires a General Purpose server with at least two data disks. To configure the RAID we will use the mdadm software RAID utility, which may need to be installed. Disks on Linux are referenced using their device name. The/dev/xvda device is your system disk and contains your operating system. We will use the fdisk utility to identify your data disk devices (usually /dev/xvde and /dev/xvdf). The first line shows the device name and size. The last line of the block shows any partitions currently configured on the drive, with their device names (like /dev/xvde1). Now that we have the device names of our data disks we can start to provision the RAID 0 with the following commands. You will get a warning if any partitions exist on the disks being provisioned. Confirm that the partitions can be overwritten and mdadm will create the RAID. Verify the RAID 0 by checking the /proc/mdstat system file. The beginning of the second line in the example shows the device name (md0), which means we can reference the array as /dev/md0. Once the array is created we can partition it to make a file system. We’ll use the fdisk utility to create a single partition on the RAID 0. After displaying some information about the device we’re editing (the array), you’ll see a command prompt. We’ll need to create a new partition using all available disk space, then write the changes to the array’s partition table. Start by entering “n” for new partition, then “p” for a primary partition, and “1” for the partition number. Just hit enter when asked for the starting and ending cylinders so fdisk will use the defaults, filling the disk with the single partition. Once the partition is created enter “w” to write the changes to the disk. After writing the partition table, fdisk should exit. Running fdisk again should let you see the array and its new partition (along with the partition’s device name). For the purposes of this article we’ll use ext4 for our demonstration and performance testing. Note: If you use ext4 on your array, make sure your system supports it. Recent distributions support ext4 by default, but if you’re using an older base operating system (like CentOS 5.3) the included kernel and disk formatting utility may not support ext4. In this case, it’s safer to use ext3 (with the mkfs.ext3 command). Creating the file system will be easy and seamless. Run the appropriate mkfs command for the file system (mkfs.ext4 to format as ext4, for example) on the array’s partition, usually /dev/md0p1. Our results from the testing showed a 16% increase in reads while utilizing (2) SSDs in a RAID 0, with a 2% decrease in write performance. The performance gains from the reads is substantial enough to warrant utilizing the RAID 0 for most purposes, but if you’re running an application that performs more writes than reads you may benefit more from using the data disks stand-alone instead of going with the RAID 0 option.